Whether you've picked them up at a local artist's fair or while on vacation abroad, masks can represent incredible moments in your life and give off an aura of charm and mystery. Even a simple masquerade mask display can make for a bold room accent, but you've got to get them off the shelves and bookcases to see the best effects. 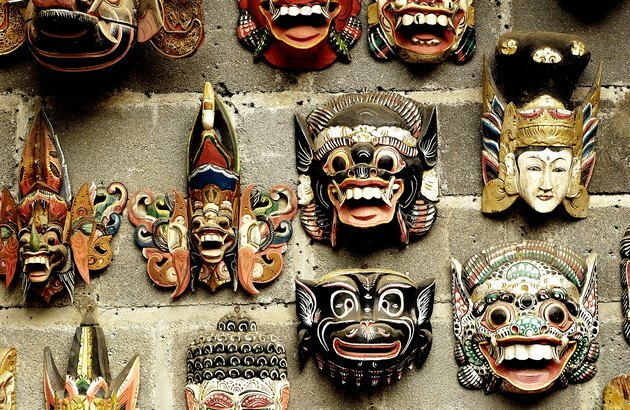 Use one of these methods to display your masks on the wall where their various shapes and colors can wow your guests and make for fun conversation starters. Particularly effective for flatter Venetian or African masks, the old tried-and-true method of hanging masks on the wall can still be one of the most effective. However, if you're hanging a large number of masks at once, it can be time consuming. Though many commercially purchased masks will have hardware specifically for wall mounts, masks intended for wear can be displayed through the use of wire, ribbon and/or cord. If the mask has ties, these ties can be replaced or reinforced with cord, drawn and tied to allow the mask to be hung like a painting. If the mask lacks this, strong wire, crossed in the middle to create a loop, can be used to create a custom mount. Simply bend the ends of the wire length into hook shapes and secure your mask by its eyeholes. You can dip the looped wire in wax to secure it further, but this will allow you to mount the mask on a simple nail or wall hook. Especially with larger masks intended to cover the head, one of the easiest methods of getting your masks on the wall is to use a specialized mask hanger or mask wall mount. These plastic and metal hangers, which are available from costume shops and online stores, are easily screwed into the wall and allow you to present your masks upright. The hangers are obscured by the masks themselves as well, allowing you to play with the idea of your masks "floating" just above the wall itself. This is perfect for a masquerade mask display to express the sense of mystery the pieces carry. If you'd like your display to have more of an art gallery feel, you can frame your masks and secure them with a foam insert. While the act of framing the mask itself may be a bit of a challenge – one you may need help from a professional framer to accomplish – doing this will allow you to both easily present your masks on the wall and give you the option to rearrange without fuss. You'll also be able to play with the idea of removing the glass from the frame. A framed display of colorful, ceramic Mardi Gras wall masks can even solve the problem of the masks seeming a bit gaudy on their own, and if framed on a black background, can create a haunting image – in a good way!